AN ARMCHAIR HISTORY-LAST OF THREE PARTS-Once the right-of-way for the future Expo Line had been purchased, everyone from politicians to homeowners to community activists debated over what to do with the route – if anything at all – and the issue polarized just about everybody who cared. Should it be a subway? A busway? A bike path? A weed garden? None of the above? 1989 – “The residents of the Pico-Westwood area, Rancho Park, Cheviot Hills have a lot to worry about” if the line is built through there (The Outlook, 6/1/1989). 1989 – “The travel patterns have changed since the right-of-way was laid out in the 1930s and 1940s. The technology and the route are wrong for the 21st century” (The Outlook, 6/19/1989). 1989 – Exposition is “no place to build a line,” “a foolish idea” and “a bald-faced attempt by the city of Santa Monica to ram something down the throats of the city of Los Angeles” (LA Times 7/16/1989). 1989 – “You have unleashed in this area a political monster” (To the head of the Los Angeles County Transportation Commission at a forum sponsored by the Cheviot Hills Homeowners Association) (LA Times 9/17/89). 1990 – Los Angeles City Councilman Zev Yaroslavsky said he would not oppose acquisition of the Exposition right-of-way “so long as the acquisition does not carry a commitment to build a light rail system” (The Outlook 3/8/90). 1991 – Mr. Yaroslavsky said it was a "preposterous notion" to envision commuters flocking through already-congested single-family residential areas to leave their cars in giant park-and-ride lots near the proposed rail line (LA Times 9/5/1991). 2000 -- "Why punish ourselves on a route that has so many problems" (MTA board member and county Supervisor Zev Yaroslavsky after the “MTA board voted 11 to 1 to back a plan that would keep a future transit system from running on the right of way through affluent residential areas from Cheviot Hills west to the San Diego Freeway” (LA Times 3/24/2000). 2005 – “This is a project whose time has come” (LA Times 4/29/2005). I suspect Mr. Yaroslavsky supported Expo Line, at least conceptually, from the beginning, but the winds were not blowing in favor of Expo Line and a politician doesn’t get re-elected unless more than half of his constituents are happy. But by 2005 the Metro Blue Line, Red Line, Green Line, and Gold Line (even the Orange Line bus way was doing very well) had proven themselves and even the most astute politician cannot oppose success. Los Angeles also had a more pro-transit mayor in Antonio Villaraigosa than Tom Bradley or Richard Riordan ever was. No abatement for traffic gridlock was in sight and the aforementioned rail lines showed that light rail was a viable alternative – not a substitute – to cars, busses and freeways. When the 1994 Northridge quake took out a couple sections of the Santa Monica Freeway, interest in the Expo Line was briefly renewed – the line closely parallels and even abuts the freeway in some areas – but once the freeway was fixed interest waned again. Los Angeles is a city with a short memory. It is ironic to note that USC, so well-served when the Santa Monica Air Line existed, had an administration that opposed the Expo Line. Fortunately, the Coliseum Commission and the USC Student Senate supported the line and station between USC and Exposition Park. There is one obscure aspect regarding Expo Line that I have not been able to verify, and so I can only submit it as hearsay: Expo Line exists because it can’t be anything else. 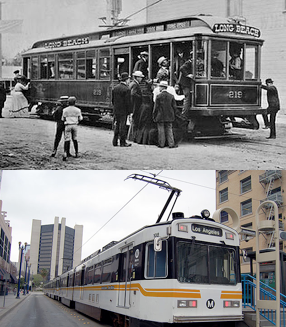 Why did the old Air Line tracks – some dating back as far as 1916 – remain in place for decades until construction on Expo Line literally began? There were no plans to use the existing rails for freight or passenger service. Why did Southern Pacific offer to sell the right-of-way to the Metro Authority? Why not sell it off to private developers and various city agencies? Some segments, for example, could have been used to widen streets. The segments in Rancho Park could have been used to build more homes or be spot zoned for apartments/condos. Other segments could have been used for commercial development. The ravine along Northvale in Cheviot Hills could have been filled in to enlarge Overland Park. When Southern Pacific won permission from the Interstate Commerce Commission to abandon the Expo right-of-way, local governments had first rights for a period of time to buy the land (LA Times 8/4/1988). The timing is interesting because Southern Pacific wouldn’t publically announce the land was for sale for another ten months. Perhaps Southern Pacific was legally obligated to offer its property to government agencies first. On the other hand, as an example, Lowe Enterprises, a Brentwood development company, purchased more than 100 acres of industrial and commercial property in downtown Los Angeles owned by Southern Pacific Transportation Company. “The sale of the properties coincides with the pending sale of Southern Pacific … to Rio Grande Industries for $1.8 billion [which was expected to close October 13, 1988]. A spokesman for Southern Pacific said the sale to Lowe is part of a plan to sell properties not vital to its railroad operations. The sale is also expected to help Rio Grande Industries pay off the huge debt it will incur in buying Southern Pacific” (LA Times 10/13/1988). The answer – if the hearsay is true -- may be because Southern Pacific had no choice; they only owned an easement that restricted the use of the right-of-way to railroad purposes only. It was a valuable right-of-way in its time, but by 1987, not so much. The actual land upon which the easement sat would be owned by the heirs of the property owners Senator Jones acquired the right-of-way from back in 1875. To repurpose the land for parks, bike paths, etc. would require returning the properties to the heirs of the original grantors. If this speculation sounds outlandish, I offer the most valuable real estate on the Westside as proof the hearsay may at least partly be correct: The Veteran’s Administration. If the Federal Government actually owned the land, it would have been carved up and sold to salivating developers ages ago. Attempts to do exactly that are made from time to time, but have so far been unsuccessful. Senator Jones donated the land for the then called Pacific Branch of the National Home for Disabled Volunteer Soldiers and Sailors back in 1888 for the perpetual use and benefit of veterans, and last time I looked, “perpetual” doesn’t have an expiration date. Despite many factions using it as a political football, Expo Line is really a neutral party. One of the slogans the Cheviot Hills organization Neighbors for Smart Rail (who exhorted Metro to “Build it right or DON’T BUILD IT!”) used to protest Expo Line was “Don’t Let Expo Block the Road.” With rare exception, streets were built across the tracks, not the other way around. It’s funny how people try to force rails into subways, but no one has ever suggested that freeways be built underground! Developers had no issues with building communities around the Air Line (Palms, Rancho Park, West Los Angeles) and school districts had no issues with building schools (Overland, Dorsey) next to the line. Another anti-Expo NFSR slogan is “Kids and Trains Don’t Mix.” Pacific Electric once provided special five car trains to take students to and from Venice High School. From what I have read and heard, the motormen might have agreed with the slogan; the students could be very unruly passengers! It is a rare child who doesn’t love trains and the schools close to the line can only benefit if they use the trains for field trips. In short, the kids will be alright. Adults on bicycles I’m not too sure about. Even the Santa Monica and 405 freeways were built to accommodate the Air Line. It is ironic that communities like Cheviot Hills and Rancho Park strongly protested the building of the Santa Monica Freeway through their neighborhoods and yet posted NFSR signs protesting Expo Line with the slogan “Don’t Let Expo Block Access to the Freeway.” Freeways divide neighborhoods and force people out of their homes because they are a transit afterthought, whereas rail and communities generally grow up together. The NFSR sign to the left deserves special mention because it plays so wonderfully loose with geography and scale. Motor Avenue runs from Pico Blvd. through the center of Cheviot Hills far away from Overland Avenue and exits under a Santa Monica Freeway and Expo Line overpass into the heart of Palms (no pun intended). In short, the Expo Line doesn’t interfere with Motor Avenue in any way. And while Expo Line will cross Overland at grade, it will not sever it as the sign implies. Fortunately, other groups rose up to help quell the hysteria over the Expo Line. Along with Friends4Expo, Light Rail for Cheviot was created within the Cheviot Hills community as a counterpoint to NFSR and did its outreach without fancy signs and access to an HOA piggy bank. Now that Expo Line’s final flaming hoops have, with hope, been jumped through, perhaps attention can now be focused on other rail projects. The Wilshire “Subway to the Sea” has been on Metro’s radar since at least 1960 (and conceptually much, much longer) and a rail connector to LAX has been languishing on the drawing boards for about as long. Maybe the time is right to resurrect the 1962 Downtown to LAX monorail proposal and – why not? -- maybe even the Beverly Hills Freeway J I’ll wager there are few who remember that proposal. While Expo Line Phase 2 is being built, people will complain. People will complain after it is finished. People who opposed the line will try it and conclude it’s not perfect, but not bad. Many people will wonder how we ever got along without it. After five years no one will remember how things were before Expo Line. It took a while, but we finally got there.